Jitendra Prasad, Rotary District Governor 9630 and Mrs Nim Prasad were official guests at the Open Afternoon at the Pittsworth Hotel Motel on Sunday, 29th July. There were a number of other guests including Pittsworth Lions Club president, Mr David Olischlager and attendees of Rotary Youth programs, RYPEN (Rotary Youth Program of Enrichment), RYLA (RotaryYouth Leadership Awards) and/0r RYTS (Rotary Rotary Youth Transition Seminar). The changeover confirming the Pittsworth Rotary Club incoming executive was conducted by Mr Prasad, who congratulated president Ros Scotney, treasurer Jenny Green and secretary Linda Birch. 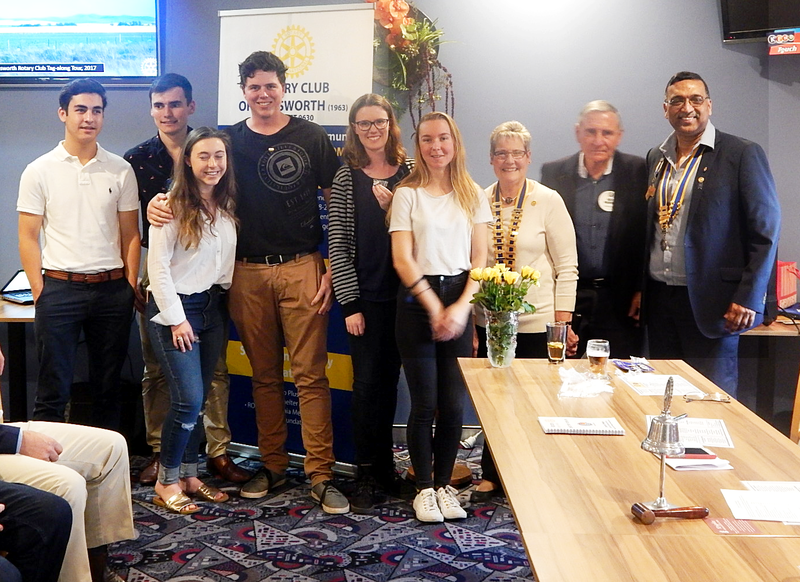 Rotary Youth Program lineup – Abdullah Haddad, Mitch Roberts, Bonnie McKinlay, Hamish Birch, Erin Birch and Kate Green with Ros Scotney, Youth Coordinator Ross Warfield, and 9630 District Governor, Jitendra Prasad. The afternoon was also marked by the launch of “Friends of Rotary”, Mr Roger and Mrs Laurel Adams were inducted as honorary members of Pittsworth Rotary Club, and addresses given by youth program participants and Rotary Showgirl, Alysia Cooper.